Zabardast, true Tiger! Baki ministers ko thordi sharam ani chaiye ke woh kya kar rahe hain! 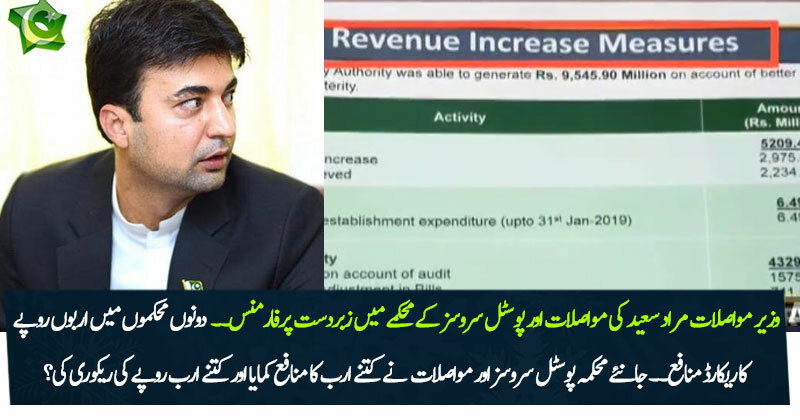 Well done Murad Saeed. He might seem a bit emotional when he speaks but so far he is delivering for Pakistan and I'm happy about it. Thus it is proved now that state organizations can make profits only if headed by right person. Hearing good news about the Pakistan Post good service at 10 times lower cost. Bhai jawan khoon hai aur ooper se Pathan, itna to banta hi hai. If ganjas came back to power in 2018 it would literally be the end of Pakistan. You can see an honest govt struggling hard to keep our head above water due to being sucked dry, imagine what these people would have done. Sucked what little was left and left us out in the open to die a slow death. ganja aur zar govt wil be the end of Pak..
Time for Sheikh Rasheed to learn a lesson! Let the figures do the talking. Shut up now and actually deliver! Well done, still lot need to be done! These young guns are much more productive, energetic and sincere than the old guards!! !